A simple and delicious homemade caprese pizza is topped with fresh mozzarella, basil, and a sweet and tangy balsamic glaze. Pizza is one of my most favorite foods. Soft bread mixed with chunky tomatoes, melty mozzarella, and fresh ingredients makes the yummiest combination. I strive to fill by body with wholesome foods, but I am a true foodie at heart and love many of the foods I probably shouldn’t. 😉 How ironic that I have a sensitivity to certain foods, including dairy and sometimes gluten, which prohibits me from eating many of these foods as often as I’d like. Every so often I can eat it small portions of dairy and not feel any ill-effects. It’s usually in the form of pizza instead of other foods, like ice cream or gourmet cheese. We love to make our pizza homemade because it’s much tastier and also less expensive than delivery. Since we make everything from scratch, we also know exactly what’s in the food we’re eating, which when you look at the ingredient lists of most of the pre-packaged foods out there, is a really good thing! Although you can buy pre-made sauce and dough, it really isn’t that difficult to make your own. The sauce can even be made a day or two ahead to lessen the amount of work at one time. Homemade pizza dough is my favorite. I’m a bread lover, so I like my crust thick and fluffy. The nice thing about this dough is that the crust can be made as thick or thin as you’d like. You can make two thin crusts or one thick crust pizza. Just remember the baking time will vary depending on whichever you choose to make. Make sure you use fresh yeast. Old yeast may not activate and have the same rising power as fresh yeast. The water should be warm enough to activate the yeast, but not too hot or it can destroy it. Don’t add too much flour or over-work the dough. This will make the crust hard and tough. Let the dough rise in a warm place. If your kitchen is too cold, turn your oven on the lowest setting for 1-2 minutes and then turn it off. You can also place a pan of boiling water onto the bottom of the oven and the warmth and steam from the water will create an ideal place for your dough to rise. I love the addition of fresh basil leaves and the balsamic glaze. The basil adds such a clean, fresh flavor and the glaze adds a bit of tang, which compliments the sweetness from the tomatoes nicely. I also added a few chopped grape tomatoes on top, but they do add a bit of moisture, especially in conjunction with the fresh mozzarella, so I had to broil the top for the last minute to evaporate some of the water that had collected on the surface. You can make the sauce, dough, or the glaze ahead of time and store in the fridge until ready to use. You can also many of these items already made at your local grocery, which will help if you’re in a pinch for time. Feel free to vary the toppings to suit your taste. Add some extra veggies or meats, like prosciutto, Canadian bacon, or sausage. You can even omit the balsamic glaze, if you’re not a fan. Looking for a delicious, gluten-free pizza? 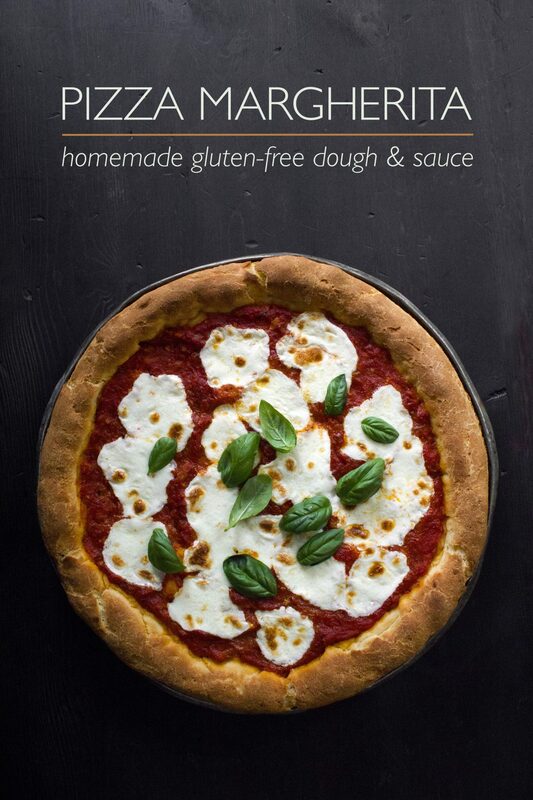 Check out the recipe for this Pizza Margherita with a gluten-free dough and homemade sauce! A delicious pizza made with a simple homemade crust and sauce. Topped with fresh mozzarella, basil, and a drizzle of a sweet and tangy balsamic glaze. *Tip: Sauce can be made 1-2 days in advance and stored in the fridge. Pour the can of whole tomatoes into a small bowl and use your hands to crush or kitchen scissors to cut up the whole tomatoes and set aside. Drizzle oil into a medium saucepan and set it over medium heat. Add garlic and onions and sauté for 1-2 minutes, until fragrant. Add crushed tomatoes and stir to combine. Allow mixture to come to a simmer over medium heat. Stir in chopped basil and season with salt and pepper. Continue to cook mixture until it thickens, about 10-15 minutes. Taste again and adjust seasonings. You can also add a touch of honey or sugar for sweetness, if needed. Place dough onto a lightly floured surface and knead for 5-7 minutes or until dough is soft and smooth. Be careful not to add too much flour or the crust will be hard. Place dough into a lightly oiled bowl and turn to coat. Cover the bowl with plastic wrap or a damp kitchen towel and let rest in a warm place for 15 minutes. If using active dry yeast, let rise about 40-60 minutes. Preheat oven to 450ºF. Place dough onto a lightly greased pizza pan or cookie sheet and gently stretch it out to about 12-14 inches, but be careful not to overwork the dough. The size will determine how thick or thin the crust is—smaller pizza for thicker crust, spread it out larger for thinner crust. If you get a hole in the crust when stretching it out, just pinch the dough back together. Place a few spoonfuls of sauce onto the dough and spread it over the crust. You may not need all of it. Top with slices or torn chunks of mozzarella. It's okay if there is sauce showing. Sprinkle the top with salt, freshly cracked pepper, and a drizzle of olive oil. Place pan into the preheated oven and bake for 10-15 minutes (time will vary depending on how thick the dough is) until cheese is melted and crust is golden brown. Sometimes I stick it under the broiler for the last minute just to brown the top, but that's optional. Remove from oven, top with fresh basil leaves and drizzle with balsamic glaze. Serves 2-4 people. oh my! Wish I could grab a slice of it right now. Looks amazingly delicious ! Thank you, Kushi! I appreciate your encouragement! I try to eat whole foods and “healthy” ingredients most of the time, but I’m with ya – I LOVE me some pizza, and it’s hard for me to go a week without dessert. And I don’t mean a healthy dessert, but like, ice cream, baked goods, etc! Haha. It’s all about balance, right? This recipe looks amazing, and I love homemade pizza dough. I know right? Balance is key and I’m glad to know there are others who strive to eat healthy but allow for exceptions from time to time. Have a great week, friend! Thank you, Harriet! It may not be the same as eating pizza in Italy, but it comes close, haha! I hope you are doing well and enjoyed your time in Italy! I can’t wait to see some of the Italian-inspired recipes you will conjure up! Thank you, Liz! Best of luck trying it out. I know you will do great! Aw, thanks Melanie! I hope you give it a try. I know you will enjoy it! Haha, thanks Kimberly! I agree, pizza would make a great last meal The balsamic glaze really takes this to another level! I hope you are doing well, my friend! This is the best recipe ever! Tried it and absolutely loved it! I gotta say, it was also pretty cool to make it with the pro herself Yum! Aw, thank you, Paige! It was really fun to make this with you. You did a great job with everything, especially the dough…you’re a natural in the kitchen! I love this pizza! You made it so pretty. It’s one of my favorite pizzas ever. Pork gives me migraines and I don’t eat a lot of red meat so this is why this is my go to pizza. I’ve never made it myself though. I’ve pinned it for later. Oh my gosh!! This looks so amazing! My husband and I love caprese salad and margherita pizza! I’m gonna have to make this for him, your pics look incredible too. My mouth is totally watering now. Yum! Hi, Kristen! I’m so glad you like these two style of pizza. Thank you for taking the time to comment. I really try to bring out the art and deliciousness of each recipe. I hope you both enjoy the recipes! this looks and sounds amazing! I f i had more time to cook I would love to make my own pizza!